One of the things about living in an RV is that you have tanks — grey water and black water tanks — that have to get emptied. It’s important that they don’t get clogged, so learning about toilet paper is more important than you might think! So, first let’s talk about the holding tanks. These are two big tanks under the bus that have outlets so they can be drained into a sewer. The grey water tank is for the water from the sinks and shower/tub. Generally, not too bad … grey. The black water tank, on the other hand, is for, well, poo. Hence the “black” water name. The only input into the black water tank is from the toilet. So all the you-know-what goes into that tank … along with toilet paper. We’re used to the coveted qualities of toilet paper being things like the fluffiness, softness and the feel against your bum. “Good” TP is also strong, so it doesn’t fall apart. If you’ve ever had that happen, you know how truly nasty it can be. ‘nuf said. In an RV, however, the TP needs to be good enough to use — BUT, it has to dissolve quickly when it’s in the tank, so it will flow out and into the sewer. Don’t want to have TP build-up in that tank; that’s not a good thing. So, the trick is to find something that provides sufficient bum-comfort, but won’t last forever. When we first started out, we didn’t actually know any of this. So we used Charmin or Quilted Northern or whatever looked good at the time. That got us a black-water tank that had to be flushed more than once. So, one time when we were in an RV store, we saw this great “RV TP” that’s “rapid dissolving” and biodegradable. 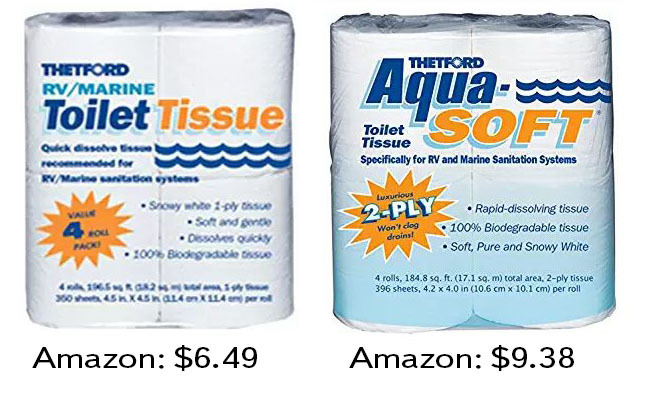 Of course, because it’s RV toilet paper, they charge extra to make it thinner and more dissovleable. It cost about $6 for four rolls, but if it was going to save us from the woes of clogged up tanks, it was worth it. Handing over our hard-earned cash, we took not one, but two, 4-roll packs with us to the bus. Have to admit, it did actually make a difference. But, since sometimes it a trick to get stuff shipped to us (especially when we’re actively traveling), we decided to check out WalMart. 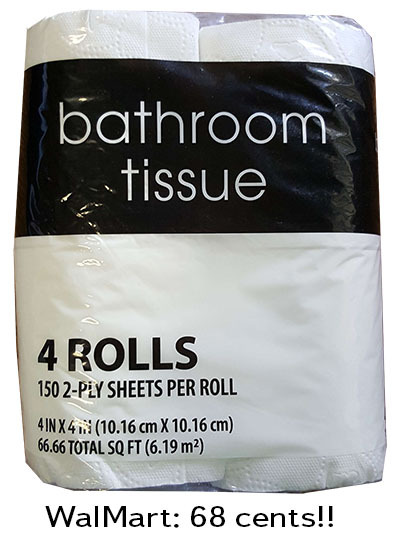 They have RV TP that is only $4.69 for four rolls. That’s better. But hey, if what we’re paying for is thinner and cheaper TP, why pay extra? Why not go to the lowest end TP and see if that works? So we tried WalMart’s generic, low-end, cheap-as-can-be, not offered online, toilet paper. It turned out to be almost indistinguishable from the high-end, special RV toilet paper. And the best thing? A pack of 4 rolls only cost 68¢ !!! Try dollar stores for one ply paper. It dissolves super fast and you don’t have to clean the black water tanks so often. It is even cheaper than Walmart. Thanks for the tip! We’ve been joking about the number of Dollar Stores and Dollar Generals there are … they’ve evenrywhere. Now I have a reason to check them out.